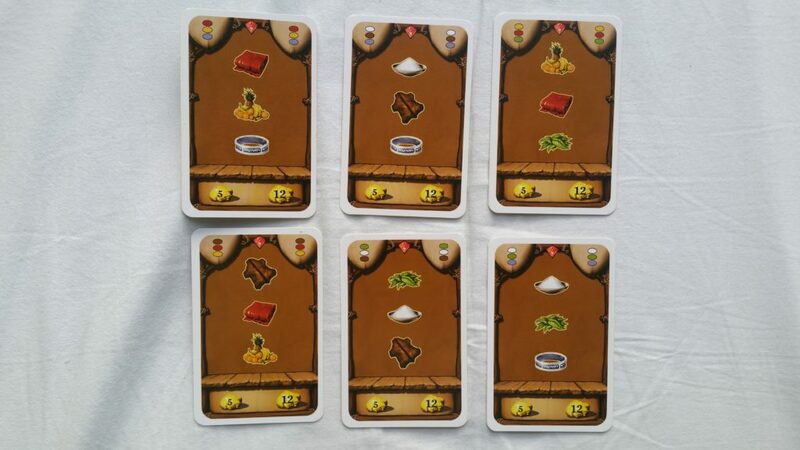 In our previous post we discussed how many copies there are of each card in Asante. Noteworthy is that there are only 6 unique cards that feature three different kinds of goods. This is surprising because there could have been 20 different unique cards featuring three goods of the six kinds of goods. This restriction makes some combinations of goods more valuable than others and this impacts our buying decisions in Asante. Although every good appears on three unique cards, some combinations of two goods appear more often than others. Salt never appears together with fruit or clothes, but appears together twice with leather, herbs and silver. So if you already have a salt, you should buy leather, herbs or silver, rather than fruit or clothes. Vice versa, if you have leather, herbs, or silver, you are best off buying a salt. Because these goods all appear twice together with salt, and only once together with each other. Fruit and clothes always appear together. So if you have a fruit, you can’t go wrong buying clothes, and vice versa.